A couple of weeks ago most of the northeast enjoyed a long stretch of very unseasonably warm temperatures. Here in eastern Ontario we had nearly a week of days above 20°C (68°F), a couple of times warm enough that my winter-acclimated body started protesting the “heat” (comes mid-summer, I’ll be laughing that I found this temperature hot). But it was glorious, from a recreational perspective. I’ve been busy wrapping up a couple of work projects, but I made sure I took some time to get out and enjoy the weather every day. From an ecological point of view, I’m curious to see if the early spring will cause serious disruptions. The warm temperatures were sustained long enough to trigger trees and shrubs into leafing out about two weeks ahead of schedule; our garden crocuses are bloomed and done already, when last year they didn’t even flower until April 9. It feels like mid-April out there, which has been a little disconcerting the last few days while it’s still been March. 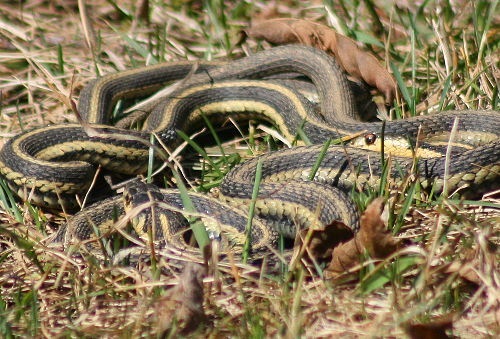 And speaking of early things… One afternoon Dan pointed these snakes out to me. They were writhing in a small pile on our lawn. I’d never seen this behaviour before but I knew immediately what was going on, so I grabbed my camera and went out to try for a few photos. It was a mating ball, of course. 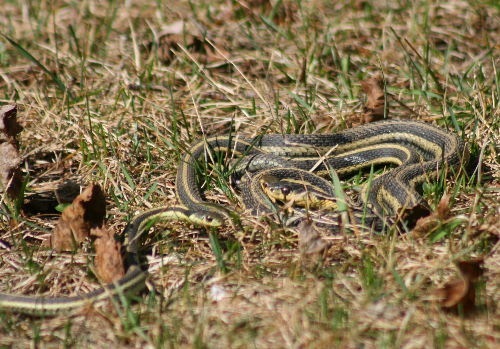 Male snakes emerge first, in the early spring, as temperatures begin to rise and the hibernacula where the snakes spent the winter begin to warm. Usually a couple of weeks after the first females begin to come out. She broadcasts a pheromone as she goes about her routine, which very quickly attracts nearby males. She’s often noticeably larger than the males are. In the photo above, she’s the darker olive-yellow individual on the left, and the brighter yellowish head on the right belongs to a male (the male, in fact; by the time this photo was taken, they were copulating). The females are a scarce resource, and males literally wrestle over who gets to court her. Sometimes a dozen snakes or more can form a writhing mass of bodies with the female somewhere in the middle of it all. That’s what was going on when Dan first spotted it, I think. By the time I got out there with my camera, one male had come out the winner. As I stood there snapping photos, a few hopeful males, late to the party, slithered in, checked out the situation, then slithered away again without joining in. I recall reading that the males track the pheromone left behind on the ground as the female slithers, so I’m thinking maybe these males have followed her scent trail only to find, once they finally reached her, that she was no longer broadcasting the pheromone. Or maybe she starts broadcasting a different one that says, “Sorry boys, I’m taken”? Perhaps the successful male gives them a fierce look that says, “Don’t you dare lay a coil on my girl”? In any case, none of the newcomers even bothered making an attempt to join her. Though I didn’t notice any reference specifically stating so, I assume the successful male is the one who manages to get his hemipenis positioned and inserted into the female first, rather than winning any sorts of one-on-one battles with the other males the way (say) rutting deer do, or winning the female’s favour the way (say) displaying prairie-chickens do. 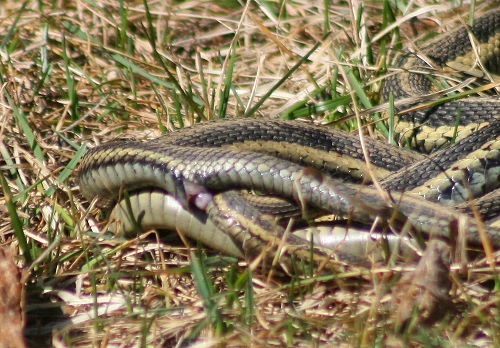 The hemipenis of snakes is sort of sac-like and usually held within the body, but expands and everts when the male is preparing to mate. In many species it has barbs or hooks that make it difficult to remove it from the female while it’s everted. Once it was just down to the two mating snakes, after a few moments the female decided she wanted to leave and started slithering away; but the two were still joined, presumably because of these barbs, and I got a look at the copulatory site as they twisted their bodies about. 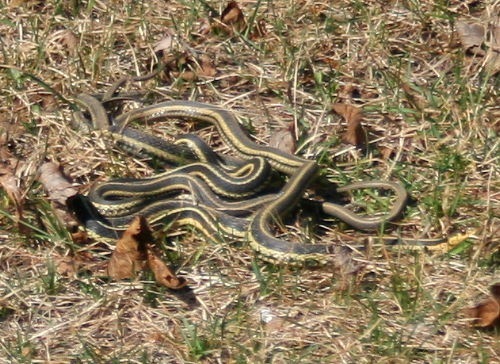 The female is the upper, duller snake in this photo, the male the lower, brighter one. They quickly disappeared into the long grass so I didn’t see what happened after that. So that was kinda cool! Spring continues to march onward here, which is giving me lots to look at and (hopefully!) lots to post about. Stay tuned!